It is now 7:44 AM PT Time on Sunday, April 21, 2019. This competition is limited to the first 200 entrants. Currently there are 130 entrants. Foster Lake is a scenic reservoir located just off U.S. Route 20 east of Sweet Home, Oregon. The course is a ¼-mile length of cable certified accurate to USMS standards. Water temperature on this date has varied from 67-72 degrees Fahrenheit and will be posted at the event. RULES: Current USMS rules will govern this event. Under penalty of disqualification, swimmers may not make deliberate contact with craft, craft operators, and/or any physical features on or near the course during the swim. ELIGIBILITY: Open ONLY to adults (18 years of age or older on the day of the event) who are 2018 USMS members or foreign equivalents. Eligibility will be automatically verified through the online entry system. For swimmers who are not USMS members, USMS “One-Event” membership is available with entry for $21. One-Event members are not eligible for the USMS 2-Mile Cable Open Water Nationals but may swim in a separate non-championship category. One-Event members are not eligible to score team points in the One-Mile LMSC Championships but may swim in a separate non-championship category. SWIMWEAR: Current USMS swimwear rules will govern this event. Category I suits are required to be eligible for the USMS 2-Mile Cable Open Water Nationals & the One-Mile Oregon LMSC Championships. Category II suits--including wetsuits--are welcomed in both swims but tabulated separately from Category I suits. See event website for swimwear details. SEEDING: In both swims, all swimmers will be seeded fastest to slowest by 1650-yard time. ‘No Time’ entries will not be accepted. Seeding changes will not be allowed after the heat sheet is posted. It is to your great advantage to enter an accurate pool time with no adjustments! TIME LIMIT: Swimmers who cannot swim one mile in 45 minutes or two miles in 1:35 should NOT enter these events; swimmers on the course after these time limits may be stopped and listed as DNF in the results. STARTS: In both cable swims, each heat will consist of seeded waves (8-12 swimmers each) starting 20 seconds apart. The USMS 2-Mile Cable Open Water Nationals will be contested clockwise and the One-Mile swim will be contested counterclockwise; these directions will be alternated annually. SAFETY—OUR PRIMARY CONCERN: Safety boats will monitor the entire course and medical personnel will be on-site. Swimmers must wear a brightly colored swim cap provided, have their race number on their arms (or hands when wearing sleeved wetsuits), and follow all announced safety rules without exception. REGISTRATION—ONLINE ONLY: All entries MUST be received by July 2. Due to organization & seeding needs, late or day-of-race entries will NOT be accepted (except for relays, see below). Please don’t even ask. ENTRY LIMITS: The entire event—including both swims—is limited to the first 200 registrants. We will maintain a waiting list if early registrants drop out early enough to notify others. ENTRY FEE: One swim is $40. Two swims are $55. OMS SANCTION SURCHARGE: There is a required $5 per swimmer surcharge to cover the cost of USMS-mandated sanction insurance. RELAYS: In the USMS 2-Mile Cable Open Water Nationals, cumulative relays will be accepted for National Championship places, All-American honors, and USMS records. In the One-Mile swim, cumulative relays will be accepted for records. Enter relays & pay fees on race day only. Bring club mates for relays! Category I suits are required to be eligible for relays. RESULTS: Will be posted promptly after each swim, and at www.comaswim.org and www.swimoregon.org after the event. USMS 2-Mile Cable Open Water Nationals results will be posted at www.usms.org. RECORDS: Courses for both race distances are surveyed & certified, and qualify for National, Oregon, & Foster Lake Course cable swim records. See the event website for current records. Category I suits are required to be eligible for records. AWARDS: Awards to individual swimmers in the standard USMS age groups. Medals to eight places in each group in the USMS 2-Mile Cable Open Water Nationals. Championship patches to the USMS winners, who must be full USMS members. Custom ribbons to three places in each age group in both Category I & II suit divisions in the One-Mile swim and the Category I & II suit divisions in the non-championship USMS 2-Mile Cable Open Water Nationals. OREGON OPEN WATER SERIES: Both swims are featured swims, scored 22-18-16-14-12-10-8-6-4-2 in each age group. 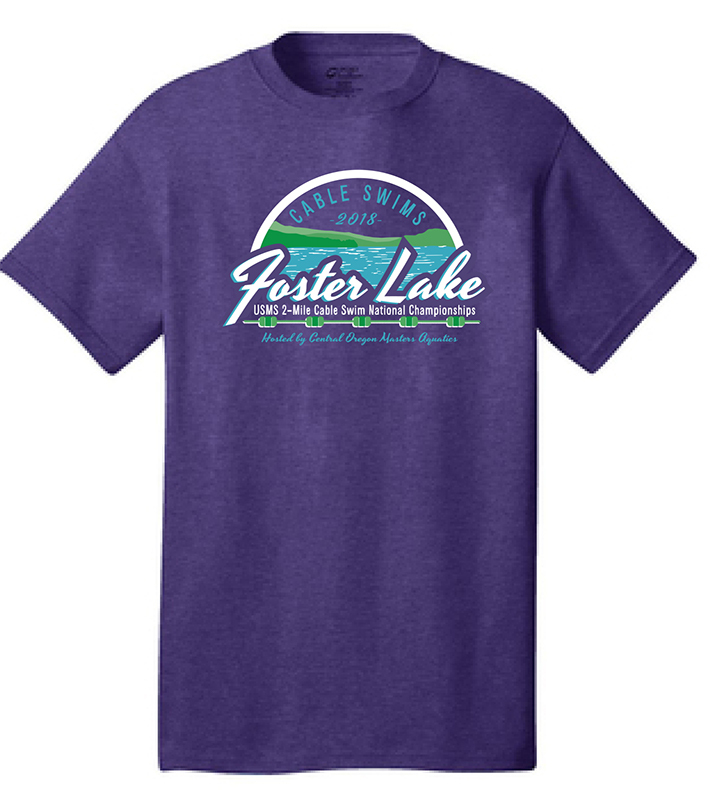 SOUVENIR T-SHIRTS: With entry, swimmers may pre-order & purchase high-quality commemorative t-shirts for $16. They will not be on sale at the event. See the Event Website www.comaswim.org for the t-shirt design, which is also shown above here on this page. HOT DRINKS & SNACKS: We’ll have hot water for drinks available to help keep you warm before & after swims. We will also offer modest snacks for our volunteers, many of whom are on duty long before swimmers arrive. Swimmers may snack too, but these snacks are limited and NOT intended to serve as your breakfast or lunch. MEALS: Swimmers will receive a post-swim meal. Swimmers may pre-order spectator meals for $10 with entry. CAMPING: Camping at Lewis Creek Park is reserved on Friday night by registration with entry. Tents only—sorry, no RVs or tear-drops. Camping fee is $10 per tent. There is NO drop-in camping on site! From the North: Take I-5 south to exit 228. Drive east on Oregon 34 to Lebanon, then south & east on US 20 through Sweet Home. 2.2 miles past the Weyerhauser mill, turn north on Quartzville Rd. From the South: Take I-5 north to exit 216. Drive east on Oregon 228 to Sweet Home, then continue east on US 20. 2.2 miles past the Weyerhauser mill, turn north on Quartzville Rd. From the East: Take US Route 20 west over the Cascades towards Sweet Home, then turn north on Quartzville Rd. Final Approach: Drive 1.2 miles north on Quartzville Rd., turn left on N. River Rd, and drive .8 miles to Lewis Creek Park. Turn left into the entrance, turn right, and park in the lower lot. PARKING: Day parking costs $5 per car; please pay at park entrance. If no attendant is at the gate, please pay at the Registration table. Exact change is welcome. LODGING & OTHER CAMPING: See Event Website for options.